Get a jump start on planning your 2017 New Years Eve weekend with these awesome events taking place throughout Southern California. There’s a multitude of clubs and festivals hosting events with a variety of DJs of many genres set to perform that will suit anyones liking. 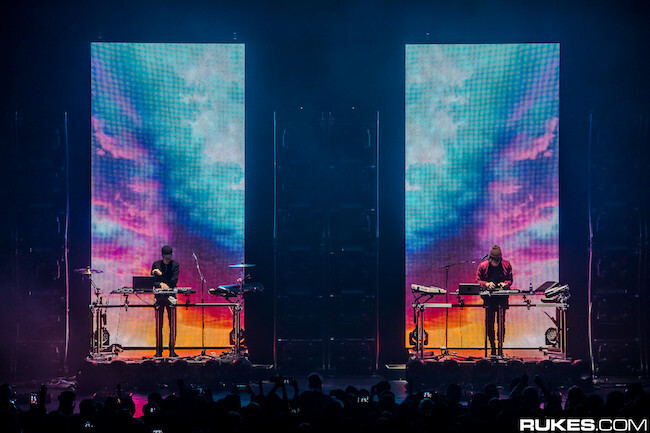 As usual, thanks to Rukes for the photo above, which was taken during Porter Robinson and Madeon’s Shelter Tour at the Microsoft Theater in Los Angeles last month. Be sure to keep checking back for more events that are added to this post! 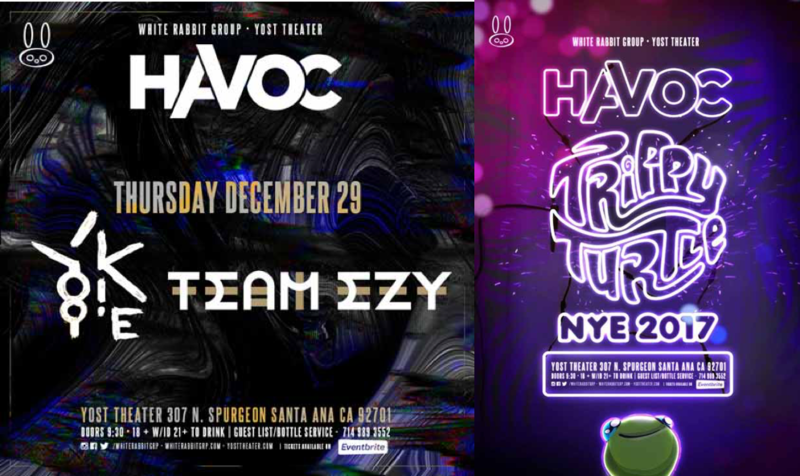 Yost Theater, Santa Ana: On Thursday, December 29th, YOOKiE and Team EZY will be playing at the Yost Theater as part of the weekly Havoc Thursdays events put on by White Rabbit Group. YOOKiE collaborated with SLANDER in “After All” and remixed their track “Dead“, so it’s safe to say that there will be lots of bass that night. On Saturday, December 31st, Havoc NYE 2017 will feature Trippy Turtle. Observatory, Santa Ana: ODESZA will be playing at the Observatory in Santa Ana on Thursday, December 29th. Progressive house luminary Eric Prydz will be the first show of the New Year on Sunday, January 1st, who recently released his “PRY 037” EP. 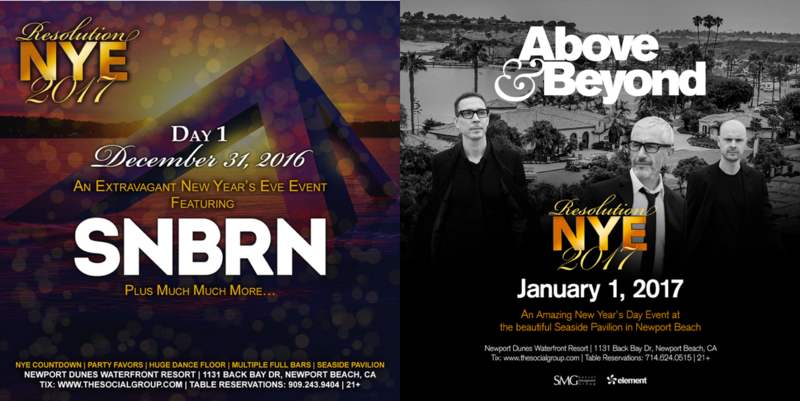 Resolution NYE 2017, Newport Dunes, Newport Beach: Resolution NYE 2017, presented by SMG, will be held over two days at Newport Dunes in Newport Beach. Day 1 will see house DJ and producer SNBRN perform, whose “Leave The World Behind” mix has been a standout this year. Iconic trance trio Above & Beyond set to play on Day 2, who are known for their legendary mixes, live sets, and Group Therapy radio show. Time Nightclub, Costa Mesa: Time Nightclub in Costa will be busy four days in a row this New Years. On Thursday, See Shogun with EC Twins appearing on Friday. Saturday will see resident DJ Steven Wright with trance/progressive house producer Arty performing on Sunday night. 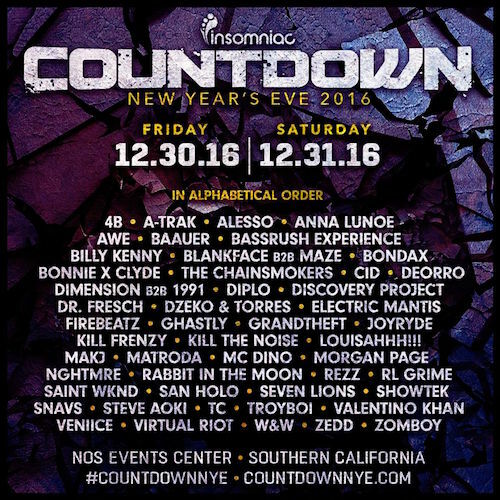 Countdown NYE, NOS Events Center, San Bernardino: Pasquale Rotella and Insomniac’s Countdown NYE event has quite the varied lineup for the two day event taking place on Friday, December 30th and Saturday, December 31st. The lineup includes the likes of A-Trak, Alesso, The Chainsmokers, CID, Diplo, Dr. Fresch, Electric Mantis, Ghastly, JOYRYDE, Kill The Noise, MAKJ, Matroda, NGHTMRE, REZZ, RL Grime, San Holo, Seven Lions, Showtek, TC, and Zedd. 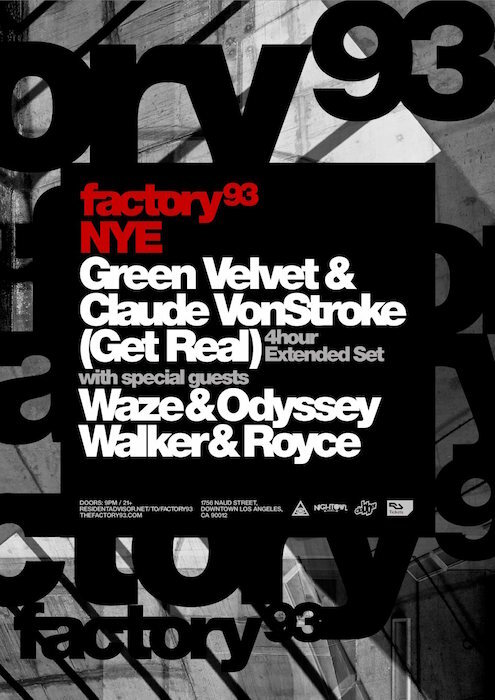 Factory 93, Los Angeles: Factory 93, put on by Insomniac, will feature techno titans Green Velvet and Claude VonStroke in a special four hour extended set. Also performing that night, which runs from 9pm to 5am, will be Waze & Oddysey and Walker & Royce. 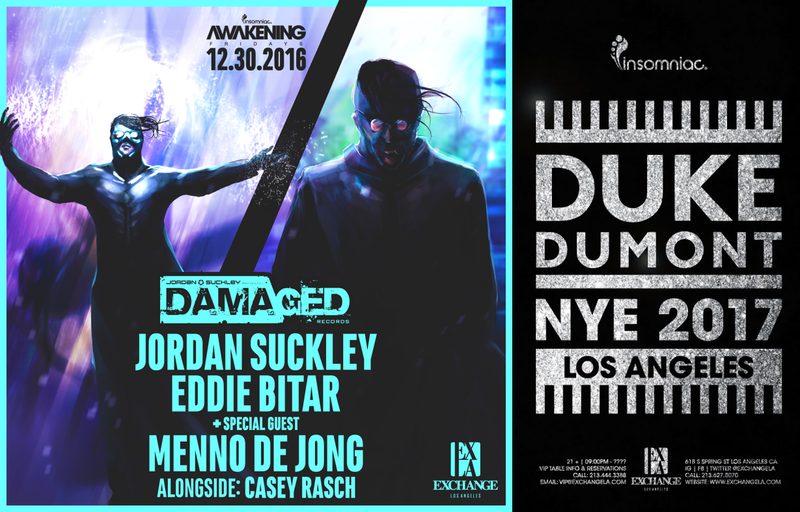 Exchange, Los Angeles: If trance and house are your go-to genres, then head on over to Exchange LA for two nights of New Years celebrations. Friday, December 30th will see Damaged Records label head Jordan Suckely with Eddie Bitar, Menno de Jong, and Casey Rasch. Performing on Saturday, December 31st will be Grammy nominated artist Duke Dumont for NYE 2017. Create, Los Angeles: Los Angeles nightclub Create will have a full slate of performers starting on Wednesday, December 28th. Trap duo Yellow Claw will start things off with the Swedish pair Dada Life playing the next night. Performing Friday will be Deorro followed by trance/progressive house artist Dash Berlin on Sunday. Sound Nightclub, Los Angeles: Sound Nightclub will have Hot Creations label head Jamie Jones on stage Thursday, December 29th, through Framework and Rhonda INTL. 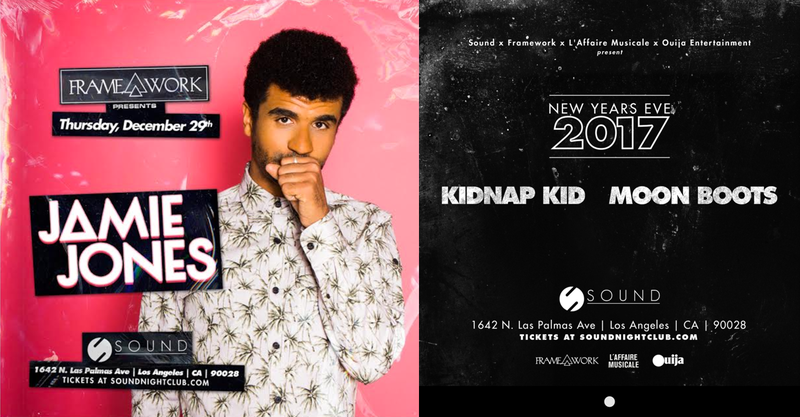 Then on New Years Eve, Kidnap Kid and Moon Boots will bring it home for the Los Angeles venue. Avalon, Hollywood: For a pre-NYE countdown, check out special guest Mayhem at Avalon in Hollywood on Wednesday, December 28th. As part of Control Fridays, the Brownies & Lemonade Takeover will include KRNE, Graves, Fatherdude, and B&L All Stars. On New Years Eve, Markus Schulz will be playing a special open to close set you won’t want to miss out on. Bassmnt, San Diego: Bassmnt in San Diego will be hosting two special events as we get ready for 2017. On Friday, get ready for some all around bass in your face from UK native Rusko. 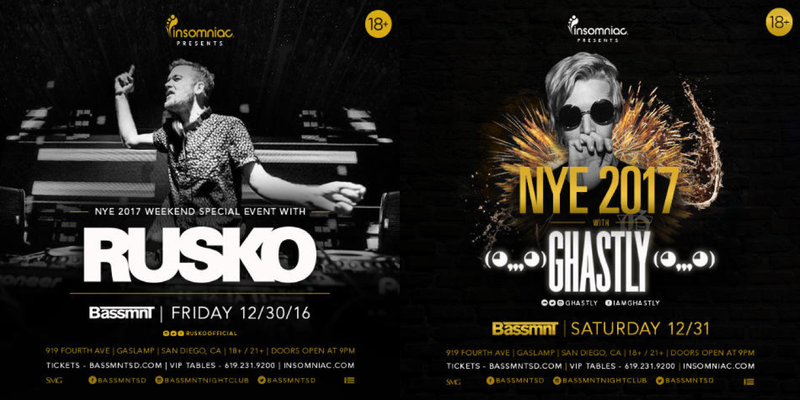 Then, ring in the new year with LA resident Ghastly on Saturday with some more brain rattling bass! Omnia, San Diego: On Friday, December 31st, you have another chance to catch Dash Berlin at Omnia in San Diego. Then, see Power 106 DJ Eric Dlux on Saturday and the always amazing Porter Robinson on Sunday, who’s currently in the middle of his Shelter Live tour with Madeon. 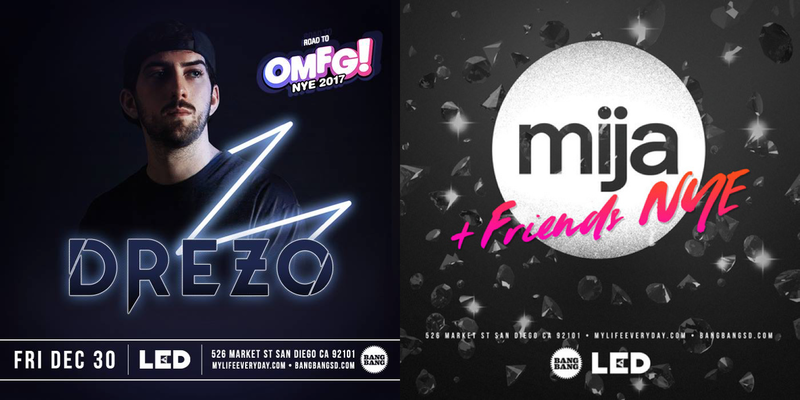 Bang Bang, San Diego: Bass house artist Drezo will be at Bang Bang in San Diego, who’s b2b set with DJ Hanzel was one of my favorites this year, along with their remix of “Need You“. Then, join Mija + Friends for the New Year on Saturday, December 31st. OMFG! 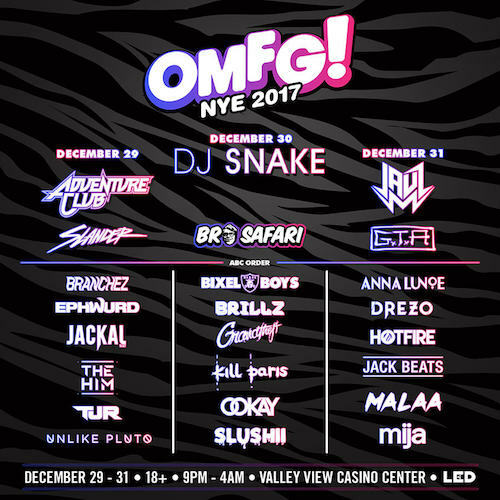 NYE 2017, Valley View Casino Center, San Diego: LED presents OMFG! NYE 2017 will be just the thing to take you into 2017 the right way. On December 29th, Adventure Club, SLANDER, Branchez, Ephwurd, Jackal, The Him, TJR, and Unlike Pluto will be playing. The performers for December 30th include DJ Snake, Bro Safari, Bixel Boys, Brillz, Grandtheft, Kill Paris, Ookay, and Slushii. December 31st will see Jauz, GTA, Anna Lunoe, Drezo, Hotfire, Jack Beats, Malaa, Mija on the decks. 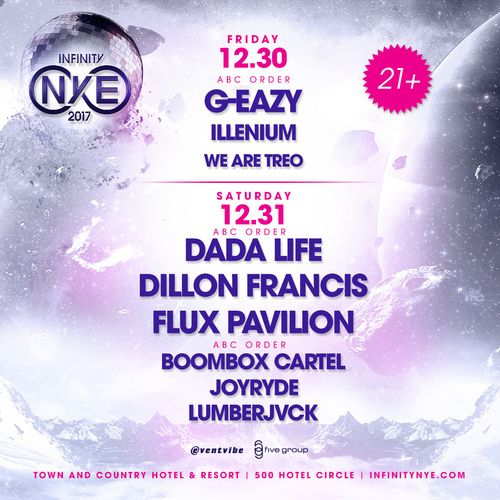 Infinity NYE 2017, Town & Country Hotel & Resort, San Diego: It’s gonna get heated in San Diego with the lineup for Infinity NYE 2017. Friday’s list of performers include G-Eazy, Illenium, and We Are Treo. Saturday will have Dada Life, Dillon Francis, Flux Pavilion, Boombox Cartel, JOYRYDE, and LUMBERJVCK take the stage.